UPDATED: Tue., July 3, 2018, 5:31 p.m.
Former Spokane Chiefs forward Hudson Elynuik has signed to play for the Toronto Marlies, the American Hockey League affiliate of the Toronto Maple Leafs. Elynuik set career highs across the board during the 2017-18 season, including games played (71), goals (31), assists (55) and points (86). Since being acquired in December of 2013, the Calgary, Alberta, native left his mark in the Chiefs’ record book, finishing 22nd in games played (245), 18th in assists (137) and 22nd in points (220). Chiefs forward Luke Toporowski has been named to USA Hockey’s 2018 U.S. Under-18 Men’s Select Team that will participate in the Hlinka Gretzky Cup in August. Toporowski, from Bettendorf, Iowa, is one of 21 players selected for the team. 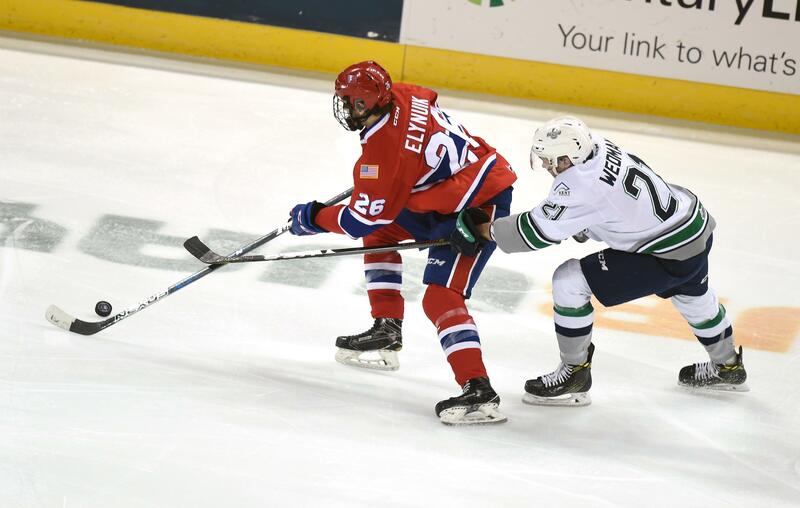 The 17-year-old, the Chiefs’ first round selection (eighth overall) in the 2016 WHL Bantam Draft, made his debut for Spokane last season, playing in 61 games and scoring 10 goals with 13 assists. Last week, Toporowski recorded three goals and four points in four games at USA Hockey’s Select 17 Player Development Camp and was named to the All-Star roster. Former Chiefs forward Zach Fischer has signed a contract with the Stockton (California) Heat, the AHL affiliate of the Calgary Flames, as announced by the Heat on July 1. Fischer, 20, joined the Chiefs this past season after being acquired from the Medicine Hat Tigers on Oct. 19, 2017. Fischer contributed 35 points (21 goals, 14 assists) in 43 regular season games with the Chiefs, and added two points (one goal, one assist) in seven WHL playoff games. Published: July 3, 2018, 3:32 p.m. Updated: July 3, 2018, 5:31 p.m.